This blog is not meant for sensitive stomachs or squeamish eyes. Please explain to me why boys (we’ll keep this subject matter focused on children although it’s possible a whole separate version of this story could be told for husbands) are the messiest, grossest people to share a bathroom with. Especially in regards to the toilet. I don’t understand how hard it is to keep the urine stream in the toilet bowl. I told you this wasn’t going to be pretty. I’m blessed enough to be able to dedicate an entire bathroom to the male children of this house. Even still, there are often times that I find myself confronted with this ongoing circumstance. So when I was sent a toilet night light I thought maybe that would help our situation. Yes, I wrote that correctly…a toilet night light. Brilliant, right? Well, not exactly. 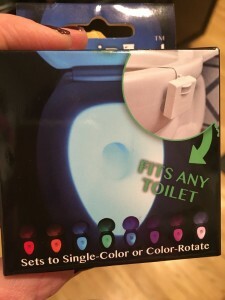 The truth is that it’s nice to have a night light on the toilet but don’t ask me to touch it because it’s become a pee covered night light. If seeing the toilet is the problem, then this will solve your problem. If peeing correctly in the bowl is your problem, sadly this only gives you more of a problem. Anyway, worth sharing. If you’d like one of your own, click here.